There's no need to be nervous when ship your bike or entrust it to the rigors of airline travel if you're using the Nashbar Pro Bike Case. The super-strong ABS plastic construction is built to withstand plenty of punishment while copious foam on the inside keeps your bike safe and secure. An aluminum stabilizer frame keeps your bike perfectly positioned while your wheels are also safely stowed in a pair of wheel bags. It's not enough to get your bike from point A to point B unless the case itself is easily mobile, but that's not an issue with the Pro Bike Case. A set of four free-running castor wheels means the case rolls super smooth and plenty of handles ensures the case is easily pulled and lifted to boot. Click for Instruction Manual Strike-proof ABS plastic construction is super-strong Internal stabilizer frame keeps your bike perfectly positioned Internal foam sheets ensure plenty of protection 4 free-running castor rollers with reinforced axle make it easy to move Double shell thickness in the roller area 3 hinges and 3 lockable clip locks, flush with frame; 2 butterfly locks 4 handles and a reinforced pilot handle for easy transport Fits most road or mountain bikes For faster packing use our alloy QR skewers NS-QRS (sold separately) Click for TSA information. 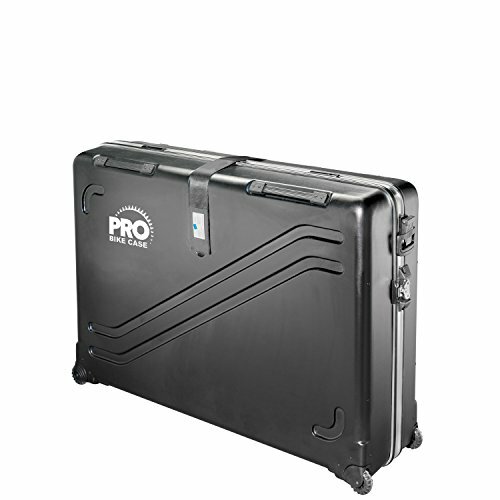 If you have any questions about this product by Pro Bike Case, contact us by completing and submitting the form below. If you are looking for a specif part number, please include it with your message.